Do your homework before choosing a vendor! There are so many great wedding vendors out there. Unlike most businesses these days you’ll deal directly with the owners, people who truly have a passion and love what they do. BUT you can also find people who mean well, but just aren’t experienced enough to put your vision together, or who just want to make a quick buck. 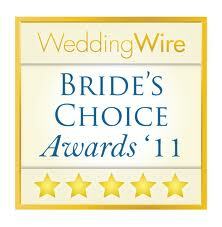 Luckily, there’s a great resource out there, WeddingWire. You can read lots of reviews about everyone from florists to make-up artists to officiants. But take reviews with a grain of salt. I met with lots of professionals who would do a great job, but just weren’t what I was looking for. You definitely have your pick so don’t feel like you have to go with first person you meet. You only get one chance (hopefully) to have a great wedding! Also just because they aren’t listed on one of the “big sites,” don’t write off wedding professionals; my make-up artist wasn’t one of the “biggies” on the wedding sites, but she was AWESOME and much cheaper than some of the other well-knowns. Use your gut (with a little back-up from review sites & message boards).